Select enhancers and promoters based on tissue and cell specificity using sliders. The FANTOM 5 consortium has mapped transcription start sites (TSSs) and their usage in 573 human primary cells and 152 human post-mortem tissues to produce a comprehensive overview of mammalian gene expression across the human body. This has been done using cap analysis of gene expression (CAGE) and single-molecule sequencing. The result is a unique gene expression profile atlas, focused specifically on core promoter utilization. CAGE has advantages over RNA-seq or microarrays for this purpose, because it permits separate analysis of multiple promoters linked to the same gene. The PrESSTo tool allows for the selection of promoters expressed in specific sets of tissues or cells based on slider thresholding, where the number of promoter adhering to a given combination of expression thresholds for cells or tissue are update in real time. Because active enhancer regions are transcribed, we identified a distinct bidirectional CAGE pattern which could predict enhancer regions based on CAGE data. Because enhancer transcription is a powerful proxy of cell-specific enhancer activity, we could define an atlas of ~40.000 active, in vivo bidirectionally transcribed enhancers across the human body using the FANTOM5 panel of tissue and primary cell samples. 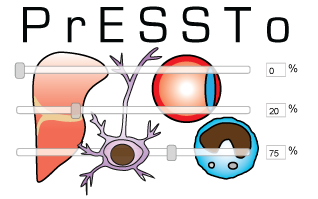 As above, PrESSTo allows for the selection of enhancers expressed in one of many cells or tissues based on sliders.